Try out these sample skits for free, then order a resource book if you like what you see! 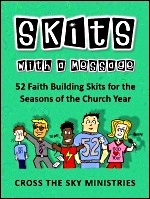 52 faith building skits for the seasons of the church year. Including Advent, Christmas, Epiphany, Lent, Holy Week, Easter, Pentecost, Thanksgiving, plus many more. Each skit includes scripture texts, a brief message, discussion questions, and a prayer. Bad Ad Destroyer A life-size app eliminates bad ads and replaces them with good messages from the Bible. Billy the Kid God answers a kid’s prayers in unexpected ways, teaching him what’s best for his life. Welcome To Our Church Three seasoned church members welcome a curious visitor to their congregation. The #1 Rule A line of students struggle to obey the teacher until they recieve the #1 rule. All I Want For Christmas Four students share their Christmas wish lists and some deeper wishes too. I Doubt It Thomas doubts everything his friends tell him until he hears about Jesus. We packed a TON of skits into this book! It’s ideal for youth retreats, family nights, Bible studies, youth-led worship services, and special events. Includes a wide variety of themes for every occasion, plus scripture texts and discussion questions for youth Bible studies. Bully Bob A skit about dealing with bullies with the power of prayer and God’s love. Pajama Jones Light and dark go toe to toe in this quirky melodrama of good vs evil. Family Law A suspenseful court case about family conflict, love, and grace. Little Mister Mister men find the fruit of the Spirit in a loving little mister. Jesus Can Dance Get those dancing shoes on and learn a few funky moves because Jesus can dance! Chosen By God A child of God hears the voice of the Lord and discovers the gifts hidden inside her. 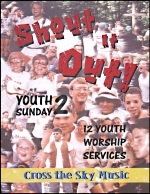 Includes 7 unique services for youth-led worship. Each service includes songs, scripture, skits, prayers, and creative worship ideas. 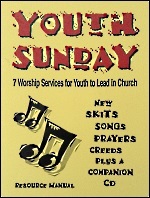 The Youth Sunday CD supports the resource book with 25 favorites from Cross the Sky Ministries. Songbook also available. Danny The Kid The power of God’s Word plays a key role in this exciting western melodrama. The Big Red Box It’s big! It’s red! And it’s free! Just exactly what’s inside that big red box anyway? Frozen People Reach out with the love of Christ to those around you! What Can I Do For You? Go ahead! Take a risk and radically love those around you! 12 thematic and seasonal “Youth Sunday” services designed for youth-led worship, retreats, or special events. Each service includes 3 skits, faith statements, scripture, prayers, and creative worship ideas. Designed for use throughout the entire church year. The M&Ms Skit Share your faith in God boldly and with enthusiastic gusto! Cloud of Witnesses We’re being watched! Will we be faithful witnesses to God’s love? I Wish Youth open up and share their thoughts about life on a deeper spiritual level.